Okay, my gathers are not evenly spaced, but that's the best I could do. I went back and re-spaced them, but they still bunched up in the middle. As far as the pattern goes, I'm happy with it. The instructions were good and I think it was easy to put together. 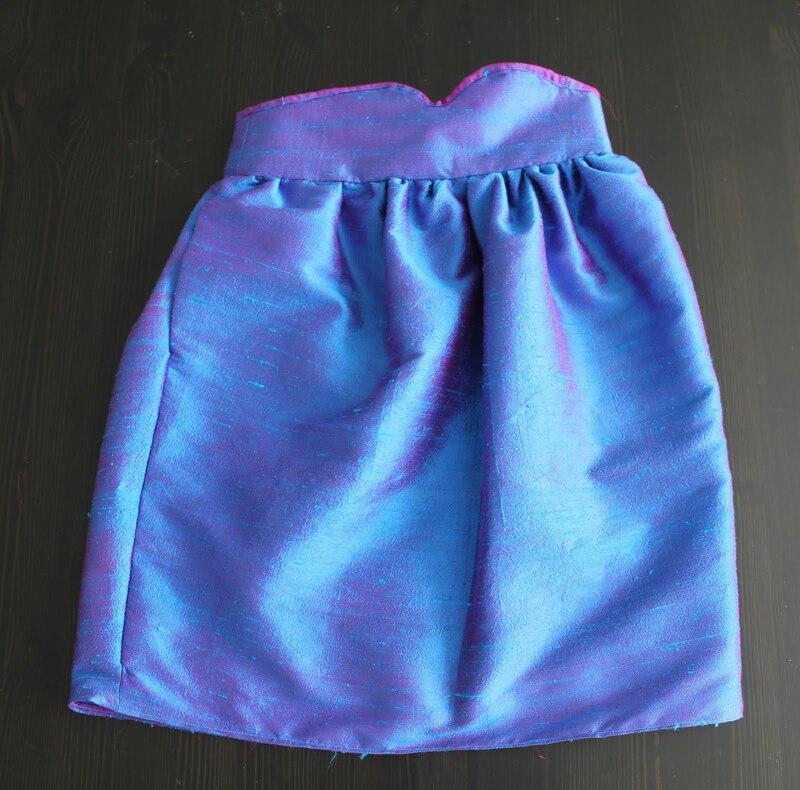 The only difficulties I had were in adapting the pattern to use with a lining (odd that it is not lined though...this kind of skirt really needs either a slip or a lining) OR working with the silk OR my machine and my pinking shears eating the fabric. I didn't insert the lining in the best way possible, but it's an improvement over my red cotton trial version. The silk is so delicate though that I can see the zipper is already stressing it out. I'll have to tell my friend to be careful with the zipper. It's on the inside so I'm not going to worry about it! My original plan was to keep the selvedge for the hem line, but because of the pattern having a round hem and not a straight hem, I couldn't do that. What I did do though was to cut off the selvedge and use it as hem binding, which I then rolled to the inside. It wasn't pretty enough to keep it on the outside there. However, I did keep it on the outside at the waist band. I like the effect it has there - a slightly more rigorous trim that provides an interplay for the classy, shiny silk. And of course it picks up the pink threads showing throughout the fabric. All in all, I think the pattern and the fabric go well together. But the fabric is definitely not hard-wearing. I think because of that it's more of an 'upon occasion' skirt than an everyday skirt. I procrastinated forever because I was scared of it! Well done.I have made over the past couple of weeks two dresses for my friend...both have been a compete catalogue of disasters.The red dress is now too small and I have to alter it and the second dress,a blue one,was going ok until this morning...I just finished the hem and was snipping off excess fabric only to cut a big hole in the dress.I think you might have heard me swearing where you live.Never ever have I cut a hole in a dress before typical that it had to be for a friend.Needless to say the hemline is now much shorter than originally planned!! Never again will I sew for a friend...too stressful. This skirt looks really sweet and I love the pink shot fabric...gorgeous.Well done for finishing it too with your sanity intact!!! The first thing I sewed for another person (well, recently) was a shirt for my sister. And while I was hemming it I cut a hole in it! And you know, I think I just darned the hole. The skirt is lovely Donna. I like the extra pinkness on the waistband. Skirts with pockets are always the best in my book! Well done for sewing for a friend. I haven't made anything for a friend for about two years. I just feel that I am not upto finishing to a high enough standard for someone else! I can live with my mistakes and shortcouts but don't want to impose them on another person! OH WOW! 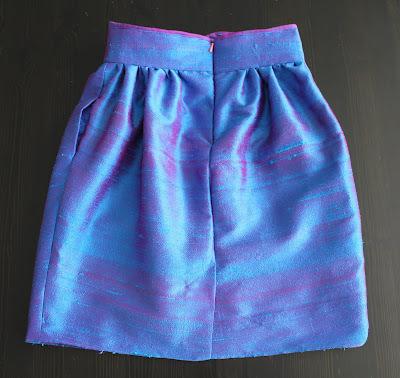 I love the style paired with this fabric - the waistband is just perfect!